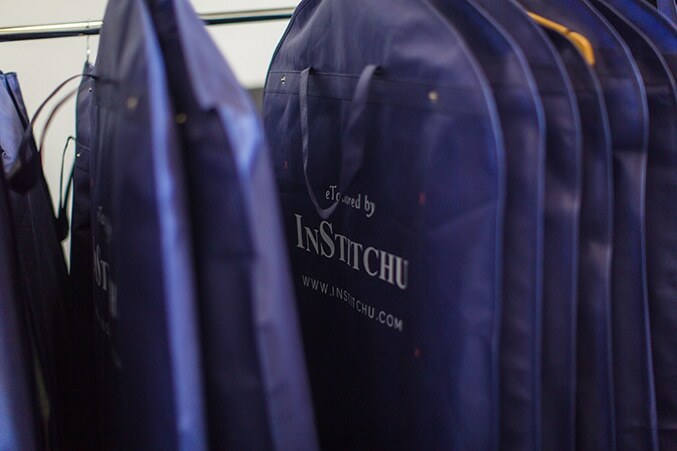 InStitchu uses the latest technology during suit manufacturing to ensure the most accurate fit. Our methods include laser cut patterns and fabrics, CAD and measurement algorithms combined with hand sewing and stitching components. InStitchu is constantly sourcing the very best fabrics from around the globe for your designing pleasure. We stock only the highest quality array of fabrics, from 100% Australian Merino Wool suiting fabrics, Italian Mill suiting fabrics to 100% cotton shirting fabrics, we want our customers to wear only the finest quality. The attention we pay to the smaller elements of your custom InStitchu design is what will make it the best garment you have ever owned. Down to the hand stitching on your buttons, you can be confident we have gone to great lengths ensure the utmost standard of quality in production. The focus of every InStitchu garment is always on creating a perfect fit. From the moment your measurements are taken to the instant your fabric is cut, our team is working towards a vision of a suit that is defined by the shape of your figure. Every step of the way, from fabric selection to stitching we place an emphasis on quality control. We appreciate our customers for putting their faith in InStitchu and want to reward this with the highest quality product we can produce. Renowned for being the most versatile, breathable and soft natural fabrics in the world, we always use 100% Australian Merino Wool for our core InStitchu range. 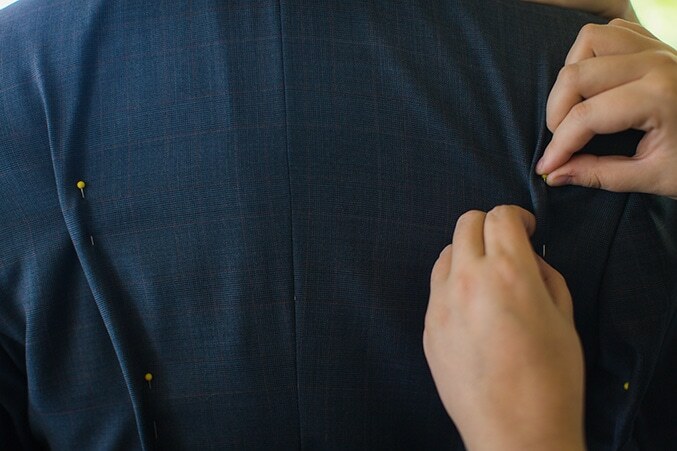 The lining of a suit is just as important as the fabric. Bemberg is a fibre derived from cotton and thus is silky and soft and excellent at absorbing moisture and releasing it. Bemberg lining will also work to moderate the temperature inside the garment as opposed to cheaper types of lining material. Freudenberg interlinings are a symbol of quality in the suiting industry. They are used to help high quality suiting fabrics reliably retain their defined shape. 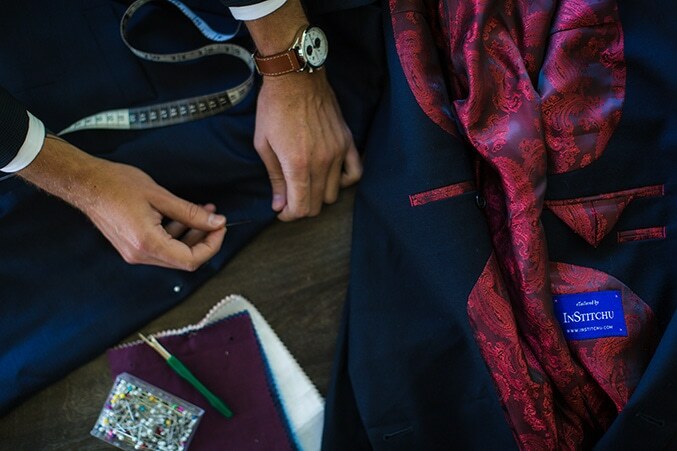 While still using old world tailoring techniques, our pattern makers will analyse your measurements, fit profile and sizing data to create a unique design using Computer Aided Design technology. We use the latest laser cutting technology to ensure your chosen fabric will be cut exactly to your recorded measurements. Whether it's having your name or initials monogrammed into your jacket or an extra ticket pocket inserted onto your blazer, our endless design possibilities mean your suit will always be a reflection of who you are.